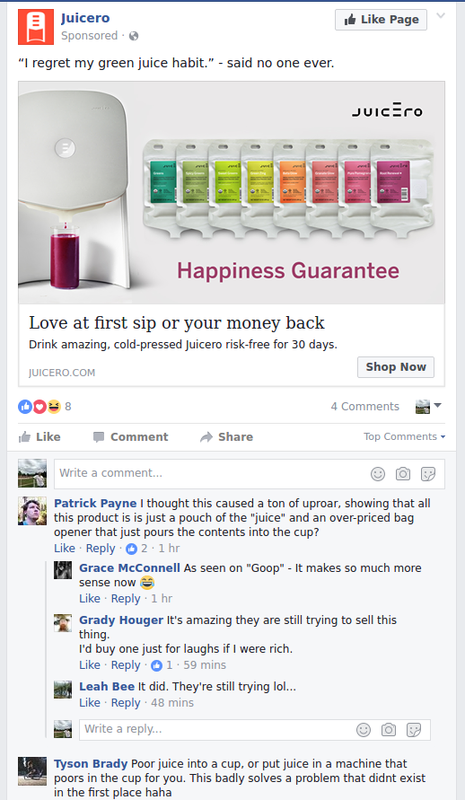 Can an online marketing campaign onslaught save Juicero? If you follow the news out of Silicon Valley, you’ve probably heard of Juicero, the juicing machine that apparently costs you several hundred dollars to do to a pack of juice what you can equally well do with your bare hands. Love at first sip certainly doesn’t come cheap! Also, it may be just us but those juice packs caught our eye before the actual machine to the left did… they bear an uncanny resemblance to IV fluid solution bags. So, do you think turning on the social media advertising spigot save this rather expensive gadget? Remains to be seen in our opinion… it sure looks like they could do with a bit more attention to comment moderation. In the meantime we can only wonder about the ROI and conversion metrics they’re getting with these ads, if they’re measuring them. Cool logo by the way. Probably cost at least as much as one of their machines. Tracking Talk (TrackingTalk.com) is a blog dedicated to the art and science of performance marketing. Our parent company is Traffikoo, an online marketing company and ad agency founded in 2005. Traffikoo advertises for clients worldwide, and offers the ReferDigital suite of online selling tools and affiliate/dropship network, as well as marketing SaaS tools such as Addue, an all-in-one online marketing toolkit, and 123ORM.com, a reputation management tool.